I love cookies. Every week I experiment with different recipes and ingredients and I think the more difficult to succeed in all these recipes is cookies to stay smooth and crispy and not becoming too hard when they are cold. 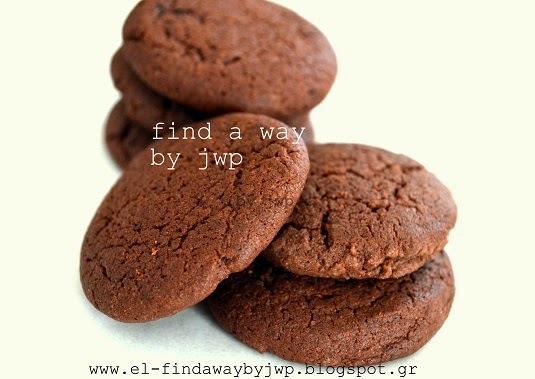 This recipe of cocoa cookies I've made yesterday was exactly like this, smooth and crispy. • Preheat oven to 374°F (190°C). • In a bowl beat the egg with the sugar and then add the butter. • Mix flour, baking powder, cocoa and salt, and add them in the mixture. • Make small round cookies and place them in baking paper. • Bake them to 374°F for about 10-13 minutes. Extra tip: Don't make them when you are on a diet... you can stop to one bite!!! Zina Z 15 Ιουλ 2014, 3:36:00 μ.μ. χαχαχα η υποσημειωση ειναι σημαντικη!!! θα τα δοκιμασω κουκλα! joanna papanikolaou 15 Ιουλ 2014, 5:22:00 μ.μ. Παθούσα ούσα ...!!! Περιμένω τις εντυπώσεις σου Ζίνα !!! Σ'ευχαριστώ πολύ και καλή συνέχεια!!! Christina Makri 15 Ιουλ 2014, 7:57:00 μ.μ. Tante Mali 16 Ιουλ 2014, 12:57:00 μ.μ. oh I love quick and easy cookies!!! Your's are perfect for the summer time! And - Pablo Neruda - you're so right, he was one of the best! Thank you so much for your charming comment and your lovely visit! Dimitra Decorasylum 17 Ιουλ 2014, 2:24:00 μ.μ.